The number matters. Only a few earwigs per kg of grapes has little perceptible effect. 10 or more earwigs per kg imparted a significant taste to the wine. 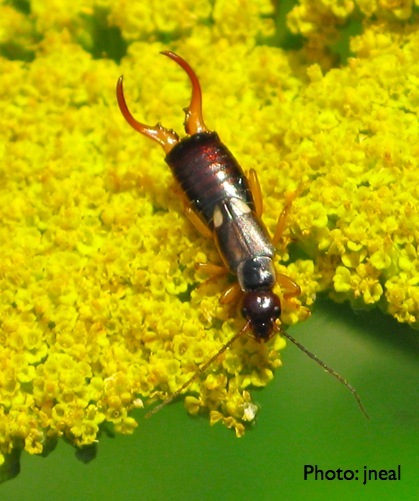 As little as 0.6 kg of earwig feces per kg produce an off flavor variably described as “animal”, “reductive”, “vegetal”, “acidic”, “bitter” and “tannic”. The study suggests that high earwig densities in grape orchards can lower the quality of wine. European grape growers may alter some practices that reduce the numbers of earwigs, especially near harvest. *P. Kehrli, J. Karp, J.-P. Burdet, P. Deneulin, E. Danthe, F. Lorenzini, C. Linder. 2015. Impact of processed earwigs and their faeces on the aroma and taste of ‘Chasselas’ and ‘Pinot Noir’ wines. Vitis 51: 87–93. This entry was posted in by jjneal, Environment, Food. Bookmark the permalink.